According to Rudolph Ballentine, author of “ Diet and Nutrition,” your colon contains about three pounds of microflora--bacteria, yeasts, viruses and fungi--numbering more than the cells of your body. These microbes are necessary for smooth functioning of digestion. They neutralize harmful toxins and are an important source of nutrition, from the byproducts of their metabolic processes. But when wastes build up and the harmful microbes outnumber the helpful ones, it is time for a colon cleanse. Constipation, gas, bloating and abdominal pain are all symptoms that your colon may need cleansing. A healthy colon is not blocked up and produces several bowel movements every day. A feeling of overall dis-ease and lethargy may also indicate that a cleanse is needed. Ballentine recommends that everyone, even if they do not experience these symptoms, should cleanse the colon seasonally to maintain good health. There are many ways to cleanse the colon and herbal tea is one that can be very effective. To prepare a medicinal infusion of these herbs, add two tsp. of the dried herb to one cup of boiling water and let it steep, covered, for two to three minutes, recommends "The New Age Herbalist." These herbs stimulate perastalsis, the downward movement of the intestines for elimination. So they are especially useful in cases of constipation. Use them sparingly, since overuse may cause irritation or a dependency on the herb for elimination. Avoid using them while pregnant, and combine them with digestive and demulcent herbs to strengthen and soothe the intestine. According to "The Illustrated Encyclopedia of Healing Remedies," good laxative herbs include senna, which is very strong, and fenugreek, which is effective but gentler than senna. "The New Age Herbalist" recommends slippery elm and marshmallow root to relieve pain and irritation. These herbs form a mucilaginous substance when mixed with water, which helps remove built-up waste from the intestinal walls and soothes irritation and abdominal pain. Licorice is a demulcent as well as a gentle laxative, but avoid using it when pregnant. Carminatives aid digestion and relieve gas. They gently cleanse the colon by helping it do its work better. "The Illustrated Encyclopedia of Healing Remedies" and "The Holistic Herbal Directory" recommend carminative, tonic and digestive herbs for good colon health. 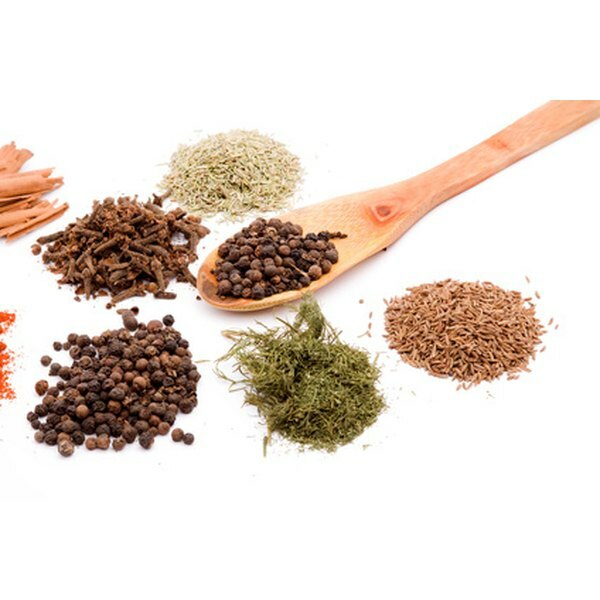 Carminative herbs include most mints, cumin, cardamom, black pepper and cloves. Tonic herbs such as lotus, peppermint and dandelion tone and cleanse the tissues of the digestive system. Digestive herbs, such as parsley, ginger, fennel or cumin seed, promote and aid digestion. Ballentine recommends that any time you cleanse the colon, you should follow with plenty of probiotics to reestablish healthy intestinal microflora. Probiotics are the "good" bacteria that populate the large intestine. Food sources of probiotics include yogurt, traditional miso paste--not miso powder, unpasteurized lactofermented vegetables--including sauerkraut or kimchee and unpasteurized fermented beverages such as kombucha or kvass. Maintain the health of your colon by eating a diet high in fresh raw fruits and vegetables, reducing or eliminating highly processed and sugary foods, eating probiotic foods daily, drinking plenty of water and getting adequate exercise. Remember that even when following these lifestyle guidelines, you may benefit from an occasional colon cleanse.